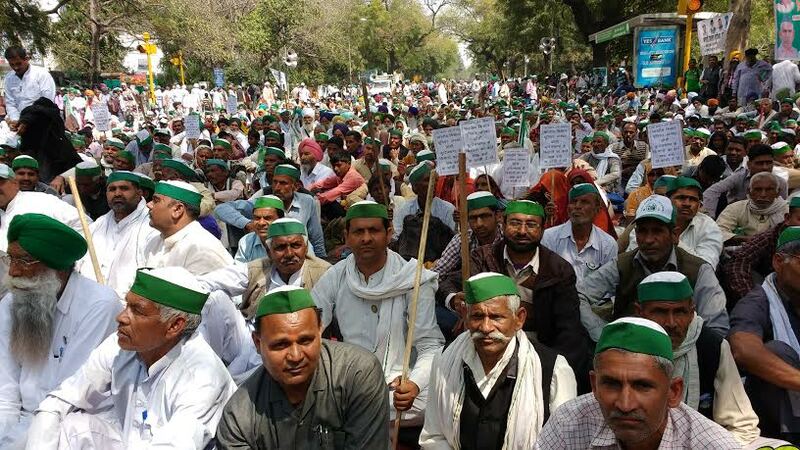 After last year’s protest over compensation for crop loss due to unseasonal rainfall, this year too, several farmers’ unions organised a kisan mahapanchayat on Thursday at Jantar Mantar where the agrarian community voiced their grievances against the Centre’s anti-farmer policies. Farmers from across the country participated in the event organised by the Bhartiya Kisan Union (BKU). Farmers’ leaders from Shetkari Sangathana based in Maharashtra, Karnataka Rajya Rait Sangh, several associations from Tamil Nadu and the Bhartiya Kissan Union addressed farmers gathered at the venue. After the Kisan mahapanchayat, farmers’ leaders submitted a memorandum to Union Agriculture Minister Radha Mohan Singh which was addressed to Prime Minister Narendra Modi. Fair and remunerative price for farmers’ produce: Farmers want the central government to fulfill the promise made to them for a fair and remunerative price in the BJP’s election manifesto which is 50 per cent above the cost of cultivation based on M S Swaminathan’s report. Fix and guarantee minimum income to farmers: A farmers’ income commission should be established. Write off farm debts completely: Debt burden has been cited as the main reason for the increasing number of farmer suicides in India. Activists say that during the 2007-08 recession, a loan waiver of more than Rs 3 lakh crore was given to the corporates. Even during the Budget of 2016-17, Rs 5,51,000 crore has been written off in the form of corporate income tax, excise and custom duties for the rich. However, farmers are being forced to commit suicide because of their debts. Keeping in mind the kind of agrarian distress the country is facing, a total debt waiver of all kinds of loans should be carried out. Central policy on natural calamities/disasters: Fair relief and compensation should be given to farmers in cases of crop loss due to natural calamities. Wrong crop loss assessment, disasters not being declared due to political reasons, delayed relief to farmers are the major issues being faced by farmers across India. Farmers want immediate relief of Rs 30,000 per hectare (ha) for food crops and Rs 50,000 per ha for cash crops against the crop loss that happened in March due to rainfall and hailstorm. Crop insurance scheme: Only cosmetic changes have been made in the Pradhan Mantri Fasal Bima Yojna which will not provide any substantive relief to the farmers. Farmers’ demands related to loss assessment, insurance papers, making insurance units at the farm level, insurance for all kinds of crops are still to be addressed. Impose a ban on GM crops: Cultivation of GM crops should be banned. Pay arrears to sugarcane farmers: There has been no price increase for sugarcane across the country in the past two years. Arrears of sugarcane farmers should be paid immediately. Do not compromise farmers’ interest in WTO: The Indian government could not protect the interest of Indian farmers in the December, 2015 WTO ministerial held in Nairobi. Agriculture imports are impacting farm livelihoods adversely and farmers’ suicides are on the rise. Agreement on agriculture in WTO is biased against the developing countries. Agriculture should be out of the ambit of WTO. No liberalisation of agriculture trade under Free Trade Agreements: The Indian agriculture scenario will be severely affected if there is any further liberalisation in the agriculture trade under the ongoing FTA negotiations with Canada, Australia, New Zealand and the Regional Comprehensive Economic Partnership. If we open up our markets for subsidised imports, then Indian farmers will be adversely affected. Ramphal Kandela from Jind said that farmers were not getting any benefits from crop insurance schemes. Despite all the tall claims made by the government, the ground situation is such that bank officials deduct insurance premiums from farmers automatically but do not give details about insurance schemes or companies, he added. Makhan Singh from Fajilka district of Punjab said that the relief amount provided was too low. Land rent and other factors are not taken into consideration appropriately before deciding the relief amount, Singh added. A group of women farmers from Utter Pradesh complained that they had witnessed successive crop failures due to drought and unseasonal rainfall and hail. National spokesperson of BKU Rakesh Tikait and general secretary Yudhveer Singh said that the main concerns of the farmers were to get fair and remunerative prices for their crops.